Jesse Donald “Don” Knotts, an actor and comedian best known for his role of Barney Fife in “The Andy Griffith Show”, was born on 21 July 1924, in Morgantown, West Virginia USA, and passed away on 24 February 2006 in Los Angeles. Recognized as one of the greatest comic actors, Don initially he served in the army, and later went to Hollywood to become an actor. A famous actor and comedian, how rich is Don Knotts? Sources estimate that the net worth of Don Knotts was over $20 million dollars, mostly accumulated by his various roles in movies and television shows, both as a lead actor and in guest appearances. 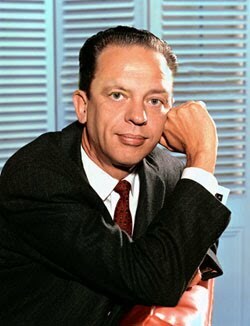 Don Knotts was the son of Elsie L. Knotts and William Jesse Knotts. His father was a farmer and an alcoholic who sometimes used to terrorize him with a knife. Don had three siblings, all brothers who were raised by their mother – his father died of pneumonia when he was 13 years old – who also ran a boarding house; she passed away in 1969 at the age of 84. He was educated at Morgantown High School, then joined the United States Army, serving in World War 2, actually the beginning of his net worth. He used to entertain his fellow soldiers as a ventriloquist with the help of a dummy, which he later threw in the sea as he got tired of it. After demobilisation, he finally graduated from West Virginia University in 1948 with a degree in theater, then went to Hollywood to pursue his career as an actor. Don’s first television show was “Search For Tomorrow” in which he worked for one year, and which boosted his net worth considerably. Later he worked on “No Time for Sergeants” in both the television and film versions. Later in 1960 he was invited to play the role of Barney Fife by Andy Griffith for his own sitcom show named “The Andy Griffith show”. He won three Emmy awards for his role in this show. Initially Don was supposed to be the straight character while Andy was the comic character but after just the first show they realized that the roles should be reversed. He left the show in 1965 after five successful seasons. Of course all this work helped Don’s net worth to rise. Knotts signed a five year deal with Universal and worked on various films including some famous titles like “The Incredible Mr. Limpet”, “The Love God”, “How to Frame a Figg” and many more. After his contract with Universal ended, Don went back to television with his second most popular show, “Three’s Company” in the role of Ralph Furley. Again, these roles saw a significant rise in his net worth. Ultimately, Don was inducted with a star on Hollywood’s Walk Of Fame. In his personal life, Don Knotts had three wives: named Kathryn Metz(1947-66) with whom he had a son and daughter, Loralee Czuchna(1974-89) and Frances Yarborough(2002-d.). During his later years he became almost blind due to macular degeneration. He died on 24 February, 2006 basically from Lung Cancer. He has a statue in the Boulevard name after him in his hometown Morgantown. 1 I don't think just funny is enough on Broadway. 2 I don't think actors get good training today. I put my training to use in everything I do. 3 I felt like a loser. I was unhappy as a child most of the time. We were terribly poor and I hated my size. 4 Well, they put me in a booth and then did some nice things to the speaker to make it come out sounding okay. 5 My idol was Jack Benny and he was the master of subtlety and timing. 6 We began to do little things, have little scenes where we just talked about things that had nothing to do with the plot. In fact, in the beginning, they didn't want us to do that. But as time went on, you see that in so many shows. I think we were the first to do that. 7 Mainly, I thought of Barney as a kid. You can always look into the faces of kids and see what they're thinking, if they're happy or sad. That's what I tried to do with Barney. 1 Like his best friend Andy Griffith, Knotts was also known to be a very private man. 2 Never retired from acting. 3 Best friends with the late Andy Griffith. 4 Best remembered by the public for his roles as Deputy Barney Fife on The Andy Griffith Show (1960) and as Ralph Furley on Three's Company (1976). 5 In 1988, he had a recurring guest role on Matlock (1986), starring with his old friend Andy Griffith; reuniting him with Griffith 20 years after The Andy Griffith Show (1960). 6 Was longtime friends with the late John Ritter. When he was on stage in Kansas City, Missouri, doing "On Golden Pond", he received a phone call about Ritter's death. He attended the funeral on September 15, 2003, just four days after Ritter's death. Before that, Knotts had appeared with Ritter one final time in a cameo on 8 Simple Rules (2002). It was an episode that paid homage to their earlier television series. Knotts was the last Three's Company (1976) star to work with him. 8 He was awarded a Star on the Hollywood Walk of Fame at 7083 Hollywood Boulevard in Hollywood, California on January 19, 2000. 9 He was nominated for a 1973 Joseph Jefferson Award for Best Guest Artist for his performance in the play, "The Mind with the Dirty Man", at the Arlington Theatre in Chicago, Illinois. 10 His last television role was a guest appearance on the animated series Dave the Barbarian (2004). 11 Received a special tribute as part of the Annual Memorial tribute at The 79th Annual Academy Awards (2007). 12 Don ceased to be a regular on The Andy Griffith Show (1960) after 1965 because originally, the show's producers had intended to end the series after that year, still at a creative and popular peak. Knotts had already signed a multi-picture deal with Universal Studios when Griffith relented to network pressure and kept his show on the air for several more years. Don said later that he deeply regretted having to leave the show, but his film commitments prevented him from continuing as a cast regular. 13 Member of the Academy of Motion Picture Arts and Sciences (Actors' Branch). 14 Died on the same day and at the same age as Dennis Weaver. 15 Buried among the stars at the beautiful and prestigious Westwood Memorial Park. 1218 Glendon Avenue, Los Angeles, California. 16 He was the youngest of four brothers. His family life was troubled; Knotts' father twice threatened his mother with a knife and later spent time in mental hospitals, while older brother Earl - nicknamed "Shadow" because of his thinness - died of asthma in 1942 when Knotts was still a teenager. 17 Took an early job plucking chickens for a market when he was told he didn't have a future in acting. 18 Older brother "Shadow" died of asthma in 1942. 19 Don was conceived after his parents had already raised other sons. His father had a nervous breakdown at the prospect of raising another child from birth. 20 Received his Bachelor's degree in Education from West Virginia University in Morgantown, West Virginia in 1948. 21 Together with Tom Poston and Louis Nye, he did the recurring "Man on the Street" skits on The Steve Allen Plymouth Show (1956). 22 Served in the United States Army, under the service number "35 756 363", from June 21, 1943 to January 6, 1946. Discharged in the rank of Technician Grade 5, which was the equivalent of a Corporal. 23 Veteran of the Second World War who was awarded the World War II Victory Medal, Philippine Liberation Medal, Asiatic-Pacific Campaign Medal (with 4 bronze service stars), Army Good Conduct Medal, Marksman Badge (with Carbine Bar) and Honorable Service Lapel Pin. 24 Technically was an Army Reservist for one week. After being inducted for World War II service on June 14, 1943, was assigned to the Army Enlisted Reserve Corps on inactive duty. Reported for active duty one week later, on June 21, and was transfered to active duty status in the United States Army. 25 Had portrayed Windy Wales on Mutual Radio's "Bobby Benson" (1949-1955). 26 He was a member of Phi Sigma Kappa Fraternity. 27 Father of Karen Knotts and Thomas Knotts. Cousin of Jodi Knotts. 28 Enlisted in the United States Army at age 19. 29 Was a ventriloquist in his early years from out of high school and his doll was named Danny. 2000 Star on the Walk of Fame Walk of Fame Television On 19 January 2000. At 7083 Hollywood Blvd.